Use the registration information below. 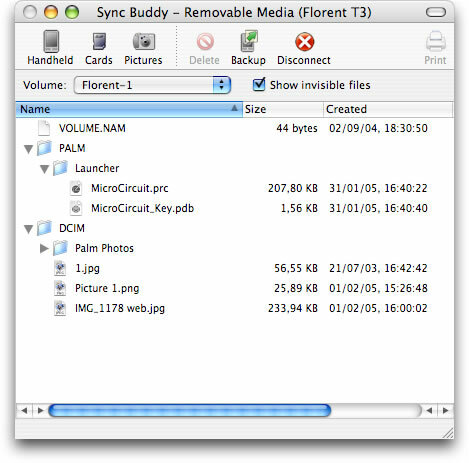 Sync Buddy is a backup, install and photo management tool for Mac OS X users with Palm OS handhelds. 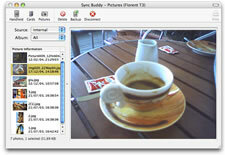 Providing worry-free backups, installs and pictures management, Sync Buddy lets you reclaim control of your handheld. It complements the standard synchronization by giving you direct access to your handheld’s contents. Want to install files? Launch Sync Buddy, press the HotSync button on your handheld, drag your file to the handheld window... Done! No additional step! No wait! Want to quickly get a picture out of your handheld? Launch Sync Buddy, press the HotSync button on your handheld, go to Pictures view, drag the picture you want to the desktop, to iPhoto, to Mail, or any other application. Done! No additional step! No wait! Sync Buddy complements your desktop software, and is perfectly compatible with Palm Desktop, HotSync Manager and Missing Sync. Flat and hierarchical file listings. 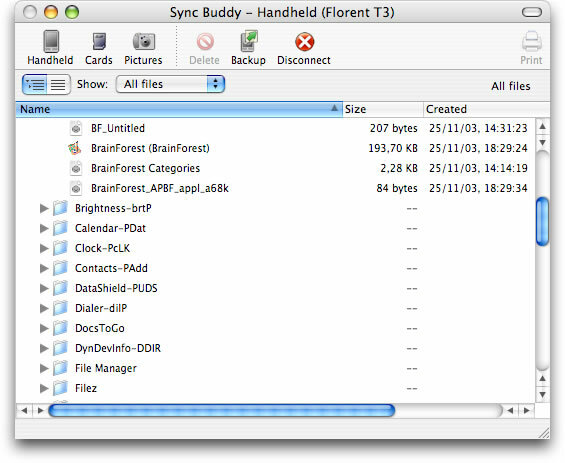 Sync Buddy displays your handheld’s files in either a flat form (all files together) or a hierarchical directory that encloses each application and its data file(s) in a separate folder. Backup files can be stored on your computer using the same arrangement, so it’s always easy to find what you need. You can also display and backup files in a flat manner, according to your taste and needs. Worry-free backups. Use the Full Backup command to back up all of your Palm handheld's contents, including third-party files and databases for the built-in applications, or use the Incremental Backup command to back up only what’s changed. Instant transfers. Just drop Palm databases and applications in the handheld window to install them without running HotSync™. To install files at specific locations on removable media, just drop them at the right location like you would in the Finder. Drag files to your computer to directly retrieve them from your handheld. Easy pictures management. Display the pictures your handheld contains with a simple click. Use drag-and-drop to copy pictures to iPhoto, to your computer or to any other application. Install pictures in a snap, and delete the pictures you don't need anymore. USB, Bluetooth, WiFi/Network support. Sync Buddy can connect with handhelds over USB and Bluetooth, but also accepts connection coming from the network. This allows you to use WiFi to connect your handheld to Sync Buddy, but also to connect handhelds remotely through the network by using Network HotSync. Removable media support. Drag-and-drop files to and from expansion cards (SD/MMC cards, Memory Sticks, etc). The install and backup experience on expansion cards is better than ever with Sync Buddy! 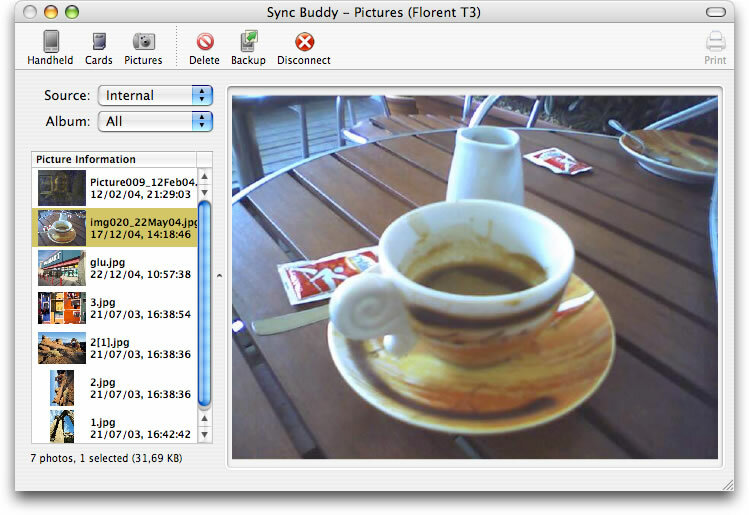 Sync Buddy version 2.1 is now a Universal Binary optimized for both PowerPC and Intel Macs. It offers faster backups as well as improved reliability and connectivity with most recent Palm OS handhelds. Copyright © 1996-2006 Florent Pillet, All rights reserved. Palm OS is a registered trademark of PalmSource, Inc.
Treo and Zire are trademarks of palmOne, Inc.